I love the Valencia circuit. The setting is not as magnificent as Monaco but interesting enough and the track is fast and challenging. In practice and qualifying it produced some unexpected results, everything pointing towards a race to remember tomorrow. Star of the weekend was Sebastian Vettel, who was fast in the practice sessions and quickest of all in Q2. His grid position of sixth leaves him in a good position to get amongst the top runners in the GP; Bourdais confirmed the form of the Toro Rosso by claiming tenth spot. Which leaves question marks over the performance of the Red Bulls, Webber only good for 14th and Coulthard 17th. The failure of the Renaults to get into Q3 makes one wonder whether the rumors of the Renault engine falling behind in power are true. It seems unlikely that STR have suddenly become better than their sister team at setting up the car. The battle at the front was mainly between Massa and Hamilton, however. Both looked to be on the ragged edge, perhaps squeezing more from their cars than should have been possible. Massa's final lap was full of little corrections as the car tried to get away from him; whatever we feel about him as a complete driver, he proves again and again that he can get that Ferrari around a track very quickly indeed. Hamilton had a few twitches through the three sessions but generally seemed much smoother than his rival. Both the Ferrari and the McLaren are so evenly matched that there should be an intense battle between the front row men in the race. Raikkonen and Kovalainen are locked together in 4th and 5th but Robert Kubica in 3rd will have to be dealt with before they can join the fight for the lead. The BMWs were quick, reclaiming their spot as third fastest team, but Nick Heidfeld gave me the usual frights before making it into Q3. When Glock got in his way late in Q2, I thought it was all over but somehow he managed to produce one more lap to go third in the session. Kubica was quick all weekend and deserved his place on the second row of the grid. 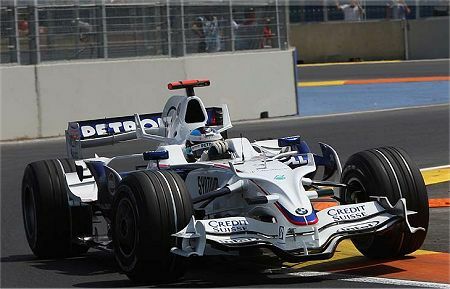 Otherwise things settled into the usual pattern, although Trulli was back to his habitual qualifying form. Glock looked quick and seemed to be doing nothing wrong, but Jarno put him in his place by getting into the final ten and then grabbing 7th on the grid. The Toyota driving team is proving a great combination, Trulli showing how fast the car is and Glock following up with increasingly solid race performances. It is amazing how closely matched the cars are these days. Each final lap completed after the chequered flag in Q2 seemed to produce more shuffling as the times went in. Drivers who we had presumed safe suddenly were on the edge and then summarily dumped - it was nail-biting stuff. It remains to be seen whether the race itself can produce such tension. The difference between the Toro Rosso and the Red Bulls was remarkable. ITV made some reference to a Mark Webber quote that they were down 25hp on the STR. Have they had another step on the engine from Ferrari? I know that the engines are supposed to be homologated but isn’t 25hp the figure being bandied around that Ferrari and recently McLaren have been able to find through lubricants, seals and the like? Why does Heidfeld leave it to the last minute to do his flyer? Then he complains that there is traffic impeding his hot lap. Surely he would be better off going out earlier, especially given his oft remarked on issue with getting heat into the tyres? F1Punter: The rumor is actually that some teams have been making power-enhancing changes to their engines under that clause that allows alterations for reliability purposes. That is what Renault are so annoyed about. More power is also being extracted by attention to such things as fuel and lubricants, but we know that Renault are working with Elf on this - it is not really a factor in any shortfall in power from the Renault engine therefore. McLaren were said recently to be getting 25bhp more from their engine but this seems unlikely after a Valencia GP in which the Ferrari engines were clearly the best on track. The top five fastest cars through the speed trap were all powered by Ferrari. Pink Peril: I couldn't agree with you more. But I suppose we must accept that the team and Heidfeld himself must know what they're doing. If I were Nick, however, I'd be demanding to be let out on track earlier.